to cherish, relish, embellish, and pass on to their posterity. We had The Lights of West Point. ..... At another time I'll tell about seeing " the lights ", in West Point. these mysterious lights? or have heard the gruesome tale of folklore that is still whispered even today? how many more lives changed forever more. there. Bill (Hobbs - '66 - of Northern VA), I'll be interested to hear your recollection! led us back in the fog, all the way to Newport News. What a night! Those really were the GOOD OLD DAYS! Thank you, Michael Darlin', you're a hoot! Before we meet next week, I would like to finish my story concerning "The lights of West Point". 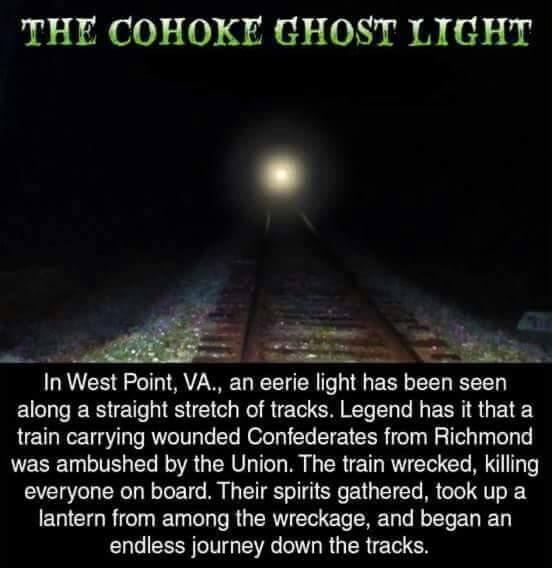 with lantern in hand was walking back down the rail tracks to warn an approaching train of the wreck. make any noise or carry a flashlight or the light would disappear. Well, Charlie had this great idea! he would just drive around to the other side of the bridge and wait for us there. He calmly replied, "You aren't scared are you, it's just a light". "No," I said, "I'm not chicken, but I think I'll have another beer before you leave us here". the light disappeared only to reappear again. By this time we had traveled maybe a half a mile. on the other side. Oh, yeah, he was waiting on us all right! kind of rite of passage or something. He also told me that the lights were real. Those were great times back then and I look back at those years and they don't really seem that long ago. Don't disbelieve what you don't see and you don't hear. "... if you don't believe this story is true, ask the blind man, he saw it too". more concerned about Human ghosts, but it was really fun! I wondered when someone would mention that story!! I was scared to death and spent the whole time on the floor of the car whimpering that I wanted to go home. Never did see the light. You can imagine what a fun date I was. WOW!!! You've really captured the...ummm...err...ahhh...SPIRit of the Light at West Point! What a great page! they'll probably find out about it the same way we did. YOWZERS! What an idea!! GIGGLES! Thanks, Jimmy! AHA! Thank you for clearing up one of the great mysteries of my youth, Mark! In all the discussions through the years, I don't recall ever hearing the supposed origins of the lights before! began the unleashing of memories.